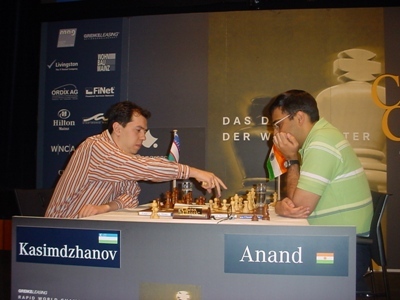 Mainz, 17th August 2007 – The World Rapid King and the defending Champion Viswanathan Anand avenged his Chess 960 Final’s defeat at the hands of Aronian by beating him on the first day of the Grenke Leasing world Rapid Championship which began today at Rhinegoldhalle here in Mainz. In the first round, Anand playing with White against his traditional rival Rustam Kasimdzhanov opened with e4 the game took the course of Ruy Lopez lines. Anand played a technically perfect game, occupied all the relevant squares and did not give Kasimdzhanov any chance to improve his position. Realising what kind of mess he was caught into, Kasimdzhanov surrendered to the Rapid King on the 45th move. 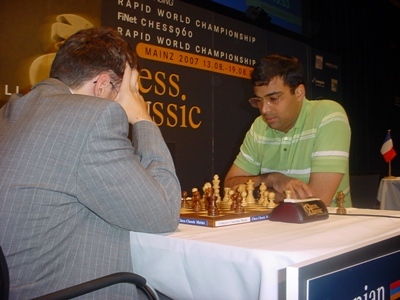 In the second round Anand was more aggressive against Aronian. In another Ruy Lopez game, by the time Aronian realized what is happening on the board, Anand surrounded the black pieces and finally gave a check to Aronian’s King on the 37th move with Rf7. Aronian, however, survived the attack, but than could not bear the pressure of Anand’s onslaught and surrendered on the 40th move. With two victories at hand, Anand was more at ease against Frenchman Etienne Bacrot. Playing with black this time Anand replied with e5 to Bacrot’s opening move of e4. In this game also Anand took to Ruy Lopez lines which gave him the earlier two wins. He had some problems in the middle game tough, but was able to keep them away. He played a relaxed game and agreed for draw when offered on the 37th move. In the other games Aronian defeated Bacrot in the first game, lost the 2nd to Anand and drew the third game with Kasimdzhanov. Bacrot beat Kasimdzhanov in the 2nd game.